It gives PerryGolf great pleasure to introduce the splendid Magna Carta hotel river barge, offering no more than just four couples the opportunity to sail a beautiful section of England's Royal River Thames in considerable comfort and style, while enjoying fine golf and history in the counties of Berkshire, Buckinghamshire and Oxfordshire. We are additionally pleased to invite fans of the popular television series Downton Abbey who cruise with us between 13 July – 7 September to ... Read More. tour the stately star of the show Highclere Castle. The filming of Downton Abbey at Highclere Castle. Magna Carta offers four staterooms of generous proportion, each beautifully furbished, and each with a spacious bathroom. 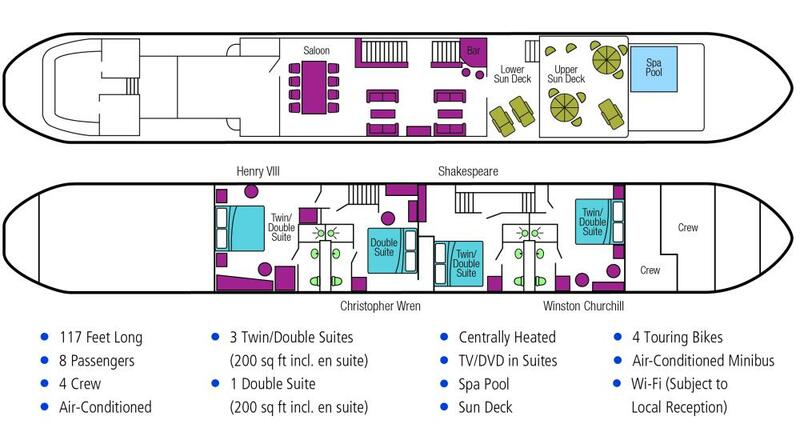 The main salon and sundeck provide comfortable space to relax. Fine dining onboard is an absolute delight. Breakfast, lunch when taken on board, and dinner are all included in the price, as are Magna Carta’s excellent choice of wines plus on board open bar of beers, spirits, and soft drinks. It’s beauty is a well kept secret, but only a mere ten miles west of the city of London centre the river meanders through quaint towns and villages, and through expansive and stunning green space. It feels like another world entirely, enjoyed in the shadow of the great metropolis. Each day, generally after golf, Magna Carta will sail for three or so hours at a stately pace to her next river mooring. It is simply splendid to sail each late afternoon watching the world glide by, ideally with a beverage of your choice to hand. Each evening a new mooring brings a new encounter; one evening she will berth in the shadow of Windsor Castle, another she will berth immediately adjacent to Hampton Court Palace. There is exceptional golf to play and we have selected the very best in Sunningdale, The Berkshire and Walton Heath. We believe this is the perfect balance of golf, sightseeing, and gentle barge cruising. For guests however with an even greater thirst for golf we will be very pleased to custom build an itinerary encompassing additional golf on some of the outstanding courses in this area. Our sightseeing program is memorable and includes visits to several venues including Hampton Court Palace, former Tudor Palace of Henry VIII, Windsor Castle, and to the Magna Carta Memorial, from which the vessel takes its name. Otherwise, enjoy a stroll by the water along the Thames Path. Chat to the lock keepers who are legendary for their knowledge and stories. Drift past peaceful water meadows rich in wildlife. Whatever you choose, you will encounter constantly changing scenery and discover fascinating delights. No stress, no hassle - just complete relaxation. Captain Dominic Read will be your host and guide for the week, sharing his experience and great love of the River Thames. His on board crew will ensure you want for nothing. Meet one of your Magna Carta hosts at The Stafford Hotel at 3pm for afternoon English Cream Tea, before being transferred to the Magna Carta at 4pm. Champagne reception and welcome by the Captain. Early evening cruise to Kingston and back to Hampton Court Palace, former Tudor Palace of Henry VIII, where we moor for the night. Overnight: Magna Carta by Hampton Court Palace. Click Here for the route MAP. Today’s golf is at the Walton Heath Golf Club, GOLF Magazine’s World #86 found less than 20 miles south of London city centre and famous for staging the Ryder Cup and five European Open Championships. Designed by Herbert Fowler in 1903, this heathland masterpiece opened for play in 1904 with an exhibition match between the legendary Triumvirate of Harry Vardon, J.H.Taylor and James Braid. Braid was the Club's first head profession where he remained until his death in 1950. NON-GOLFERS: This morning we explore the magnificent Hampton Court Palace. We tour Henry VIII’s apartments and the Royal Chapel, feel the chill in the haunted gallery and wonder at the Tudor kitchens. Outside, the gardens are breathtaking with The Great Vine, the oldest in the country still producing grapes and the famous maze. Afternoon cruise through 5 locks, Shepperton and Laleham to Runnymede. Overnight: Magna Carta at Runnymede. After breakfast guests have the option to use the excellent spa facilities of The Runnymede Hotel including swimming pools, saunas, steam rooms and beauty treatments. (Massages or any treatments should be booked in advance). Then we cruise to Windsor, past the Magna Carta Memorial and Magna Carta Island where in 1215, King John was forced to put meet the powerful barons and seal the historic document. Our afternoon excursion is to Windsor Castle. Built by William the Conqueror in 1066 and a Royal home for over 900 years, this is the largest inhabited castle in the world. We explore the State Apartments, see Queen Mary's Dolls House, St George's Chapel and enjoy the far-reaching views. Overnight: Magna Carta at Windsor. Today’s golf is at Sunningdale Golf Club, established in 1901 and ranked World #35 by GOLF Magazine. The Old Course was designed by Willie Park and opened in 1900. Another of London’s great healthland layouts, this tree-lined track is dotted with heather patches and ingeniously placed bunkers. Architecture buffs will appreciate the par-4 fifth hole where the first man-made water hazard in golf design appears in the form of a pond on the right side of the fairway. NON-GOLFERS: This morning we take a short drive to the Tudor manor house of Dorney Court, a very special home that has been owned by the Palmer family for more than 450 years and used regularly as a film location. Later, we cruise upstream past the fabulous waterside houses of Bray and through the spectacular Cliveden Reach to moor at Cookham. Overnight: Magna Carta in Cookham. This morning our first tour is Cliveden itself. Once home to the Astor family, it has amazing gardens and was, of course, the scene of much political scandal and intrique. Then, we visit the Stanley Spencer Gallery in Cookham and take a walk around the village he once described as ‘Heaven on Earth’, before cruising through Marlow to Hurley. Once in Hurley, we tour Peter Freebody’s boatyard and watch in wonder as the traditional craftsmen build and restore classic wooden craft. We have time to explore the ancient village, including Ye Olde Bell, reputed to be the oldest inn in the country, before returning to the hotel barge. Overnight: Magna Carta in Hurley. Golf this morning is at The Berkshire Golf Club. Founded in 1928, designed by Herbert Fowler and constructed by the office of Crown Lands on estates once used by Queen Anne for her hunting parties in the 18th century. This course is an absolute gem. NON-GOLFERS: After breakfast we drive to Oxford for a fascinating tour of Christ Church, Oxford’s grandest college, founded by Cardinal Wolsey and then again by King Henry VIII. The magnificent surroundings were also where Lewis Carroll wrote Alice in Wonderland. We see other interesting buildings such as Sheldonian Theatre and Bodleian Library. This afternoon we take a delightful cruise to Henley on Thames, most famous for the annual Rowing Regatta. We moor at Remenham which is half way along the Regatta course. Captain’s Farewell Dinner on board. Overnight: Magna Carta in Henley on Thames. Following breakfast disembark Magna Carta in Henley on Thames by 9:30 am. On alternate weeks, the cruise will sail in the reverse direction. This itinerary and its golf course and sightseeing inclusions may be modified at client request. Walton Heath Golf Club, GOLF Magazine’s World #86 found less than 20 miles south of London city centre and famous for staging the Ryder Cup and five European Open Championships. Designed by Herbert Fowler in 1903, this heathland masterpiece opened for play in 1904 with an exhibition match between the legendary Triumvirate of Harry Vardon, J.H.Taylor and James Braid. Braid was the Club's first head profession where he remained until his death in 1950. Sunningdale Golf Club, established in 1901 and ranked World #35 by GOLF Magazine. The Old Course was designed by Willie Park and opened in 1900. Another of London’s great healthland layouts, this tree-lined track is dotted with heather patches and ingeniously placed bunkers. Architecture buffs will appreciate the par-4 fifth hole where the first man-made water hazard in golf design appears in the form of a pond on the right side of the fairway. The Berkshire Golf Club. Founded in 1928, designed by Herbert Fowler and constructed by the office of Crown Lands on estates once used by Queen Anne for her hunting parties in the 18th century. This course is an absolute gem. All meals onboard including beverages. One dinner ashore. Minicoach transportation throughout, to all planned golf and sightseeing activities. Transfers from Central London to/from Magna Carta on arrival/ departure at defined times from defined points. PerryGolf strongly recommends that you have luggage, accident and trip cancellation insurance. It is important for your own self-interest and protection that you make certain you have adequate coverage. Check with your insurance company or travel agent. You may learn more about the Allianz Global Assistance Travel Insurance available from PerryGolf by visiting www.PerryGolf.com/pages/protection.shtml. This Travel Insurance is only available to Citizens or Permanent Residents of the USA (excluding residents of the State of Washington, New York & Texas) or Canada. Citizens of the State of Washington, may purchase an equivalent coverage directly from Allianz Global Assistance by visiting www.perrygolf.com/waprotection as can Citizens of the State of New York and Texas at www.perrygolf.com/rostates. Golf Courses: The included list may be subject to change in the event of any club accepting any conflicting national or international event, or for any other reason. Should such a situation occur, PerryGolf will endeavour to book a course of comparable standard, and all booked guests would be notified of the change and replacement venue at the earliest opportunity. Transfers: No transfers are included to or from the ship at arrival/departure airports. Set deep in the Surrey countryside lies one of England's best heathland courses. Fairways clad in heather and gorse and flanked on both sides by deep woodland of pines and silver birch. The club has a fascinating history, five times Open Championship James Braid was the first professional and members have included Winston Churchill and David Lloyd George. The American professional Tom Weiskopf considered the closing stretch starting at 13 as one of the finest in golf. The Old Course, designed by Willie Park, is the more famous of the two courses, but only acquired the title of Old when the New Course, was built in the 1920`s. The Old course, is widely regarded as one of the finest inland courses in England, with 103 bunkers, with pine, birch and oak trees lining the heather culminating with the famous 18th hole and the final green below the 'Sunningdale Oak Tree,' earning it comparisons to Augusta National, home of the Masters tournament. Home of the Berkshire Trophy, one of the most prestigious amateur tournaments in England which counts among its past champions Peter Oosterhuis, Nick Faldo, Sandy Lyle and Ross Fisher. Berkshire Red demands accurate tee shots. Dense groves of pine trees and troublesome heather line the fairways. The course has six par-3s and the 16th features a small green and measures 221 yards from the back tees. An accurate driver will have ample scoring opportunities. © PerryGolf. One of the most respected providers of custom golf tours and golf cruises to the world's most memorable destinations for men, women and couples.